Problem 1. The Speed become slower when medium size files are used. 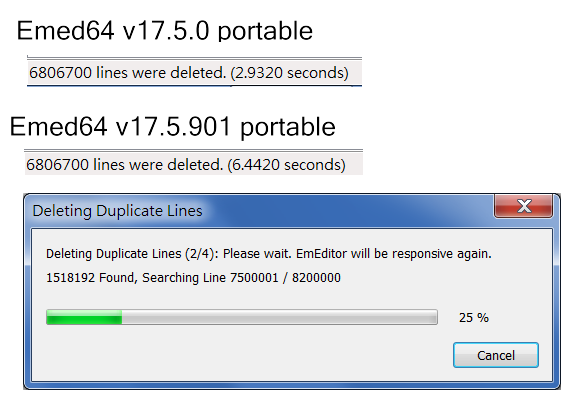 Emed64 v17.5.0 portable: around 3.0seconds. Emed64 v17.5.901 portable: around 6.4seconds, and it will have an additional message “EmEditor will be responsive again”. Problem 2. “Delete Duplicate Lines” command will spend lots of time for all duplicate data, even in small file sizes. This version was optimized for VERY large files, but I will have EmEditor revert to the original code when small to medium size documents are used. I will find a sweet spot where any document sizes will get the fastest speed. I adjusted the code on beta 2. I will continue to adjust the code until the official release. Problem 1 was fixed on beta 2. On beta 3, the problem 2 was also fixed. Thanks!